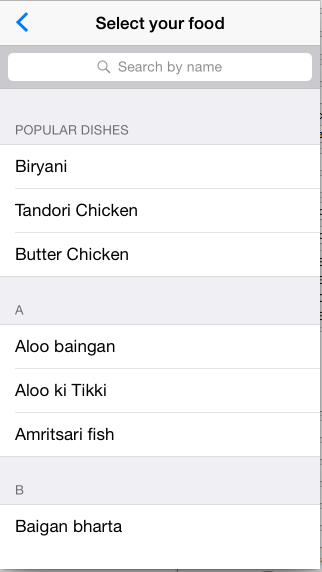 I am trying to create a table view in which it has list of dishes with sections and when we select a row it should go to new table view which consist list of popular restaurants which serves that specific food. I have created the table view with sections, but my app crashes when I reach at end of the list view. 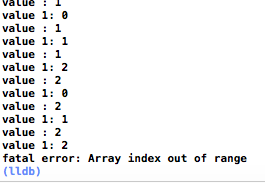 I have added my code below with the snapshot of table view and error. @IBOutlet weak var dishtable: UITableView! @IBOutlet weak var namlbl: UILabel! This is screenshot for the table view. This is the screenshot of the error when I scroll down to bottom of the table view. This is the screenshot of the console for the same error. Please also let me know how can we add the search feature for the table view. Obviously you'll want to find a nicer way to do this, but I hope this helps.